The No. 1 came in as a heavy favorite at the AO and with the exception against Gilles Simon in the fourth round, when he needed to push in the fifth set, he absolutely nailed against three fine folks: Kei Nishikori, Roger Federer and Andy Murray. There are no holes. He is relentless, he can smack side-to-side and the minute he can go forward, he puts it away. He owns 11 Grand Slams now, and given that he has won four out of the last five majors, in 2016, he will be seriously driven to win his first crown at Roland Garros. If he manages that, he will have a legitimate shot to win all four Slams. If he does, he’d be tied with Pete Sampras with 14 Slams. Wow! The Canadian has improved so much in the past month: his backhand, his return, his aggression and his volley. Given that his huge serve and massive forehands, he was very close of reaching the final. He out-punched Stan Wawrinka, he smoked Gael Monfils and in the semis against Andy Murray, he was up two sets to one, but he hurt himself and then he dropped significantly, losing in five sets. Before the year started the 25-year-old said he will win a major this year. I bet he is right. Even though Murray has lost four times against Djokovic in the Aussie Open finals, still, he fought hard and there were times when he looked pretty close. Still, his serve has improved a little bit and he is very comfortable at the net. He can use tactics to his advantage and he understands what he has to do. However, Djokovic is flat-out better than he is, especially with his forehand and maybe his famous backhand, too. Murray has to realize that. The all-time great (well, very close, at least) played beautiful tennis until he faced Djokovic, who destroyed him for the first two sets, battled in the third set, and in the fourth set he couldn’t figure it out. In some ways the 34-year-old has improved in the last couple of years, but otherwise he is declining physical. It happens to every one eventually. When the Frenchman is locked in, he is incredibly consistent and smart, dragging Djokovic into their fifth set. He played terrific, until the end, when he backed off. The Czech scored two significant wins over Nick Kyrgios and Robert Bautista Agut and he looked very driven, but against Federer, he didn’t know which way to go. If he is ever going to reach a Grand Slam final again, he must find some more strengths and reduced mistakes. 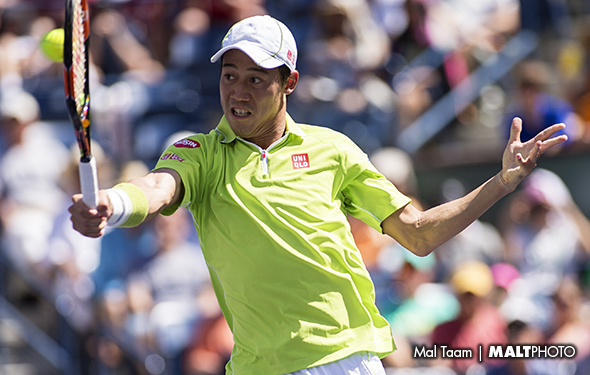 Yes, Nishikori played fairly well until he reached quarters, smacking Jo Tsonga. But, against Djokovic, it was very clear that he has a lot of work to do if he ever is going to wins a major title some day. The Aussie was very controlled in the first three matches, and he was somewhat close against Murray, but he lost in three sets. He has always played pretty well in Australia, but for the rest of the year? Hmmm. He has to prove it. The Belgian danced around when he bested the rising Dominic Thiem in four sets. However, Federer tore him apart. Nice to see the veteran Spaniard to reach the fourth round for the first time. Does he actually like the hard courts now? Jo appears ready to go once again as he was hurt during the fall. He reached the fourth round before Nishikori dusted him, but at least he can reach the top 5 again. However, the clock is ticking. Like Tsonga, he is always hurt, but at least he reached the quarters, beating the Russian Andrey Kuznetov before Raonic hit the heck out of him. Good for the Spaniard, who reached the quarter once again, needing three hours before he fell against Murray. He always tries, but maybe the 33-year-old can serve and http://www.cialispharmaciefr24.com/prix-vrai-cialis/ volley once in a while? Coming in, it was Stan the Man who had a legitimate chance to win the tournament again. However, he was a bit sick and, against Raonic, he was a little off. Next year. The 20-year-old won a couple matches and, at times, he was very flashy and skillful when he fell in four sets versus Berdych. Give him more time. Some think that the Bulgarian didn’t play well in Australia, but that is wrong as he almost won Sydney. But, he lost in Brisbane and the AO against Federer, in two fairly tight matches. Good enough for now. Big John scored a huge win over Feliciano Lopez who has always gave him a lot of trouble, but he could not figure out what to do when he faced Ferrer in the fourth round. Ranked No. 11, he has to continue to improve significantly if he is ever going to reach the top 5. The USC standout has improved every year and reached the third round, so maybe soon he can reach the second week this season. There is no doubt that Verdasco played amazingly well to upset Rafa Nadal in five sets in the first round. However, he lost in the next round, which mean he was unable to go deep at all. The rising Sock came through in the first round against the very good 18-year-old Taylor Fritz in five sets, but then he went down against Lukas Rosol in the second round. Yes, he had been sick, but he had a really chance to go deep. Next time? It is impossible to know why he lost in the first round against Verdasco, given since October he had beat everyone with the exception of Djokovic. He wasn’t aggressive enough. He simply cannot do that anymore or he will never win another Slam. The Frenchman had a fine 2015, but then he was totally shocked against the young American Noah Rubin.